great item...excellent seller, thanks !!!! Product works as described, fast shipping, good seller. Great Seller~Exactly as described~Great Packing~Fast Shipping~Thanks! XLNT. . . V. QWiK TuRN-a-ROUNd. . . would def deal /w/ again. . . ThX!! My mother has an RCA LAB-1200 turntable. I searched the internet and this was the best price! When it came in, it was well-packaged inside, in perfect condition. Easy to install (though I looked up the wrong YouTube video and my boyfriend had to put the turntable back together - it was, all along, very easy. You pull the old one off, put the new one on. No tools needed. I felt sheepish). It also came with a small card with the model # etc so we kept that for future reference...very handy to have. Now, everything plays perfectly, sounds great, works perfect, super easy to put on and super cheap price! Overall, we're thrilled!! Thanks so much for this wonderful deal! i was very disappointed in this needle, as it would not fit right. The little curved clip that fit into the tone arm was a bit smaller than the original and I had trouble getting it to fit, to the point of ruining the tone arm's alignment with the turntable. Be careful about this one. All records would skip after this was installed. 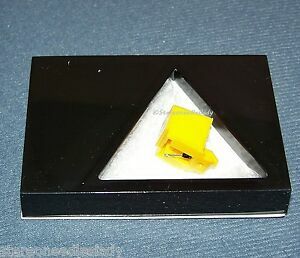 It was not the EXACT needle that came with my Sony LX300 but it has the same design and shape. The original needle was cream colored; this one is a dark yellow and orange color. It worked perfect when I pulled the other off and stuck on this new one. I've used it for about a month now and it works and sounds perfect; very easy to install too. 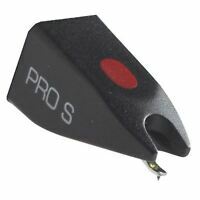 The stylus is a conical tip at .6 so it tracks welll and sounds good. The radio stations use to use conical needles to play music so you are getting the same needle style they used. That was what you heard on the radio back in older times before CD.